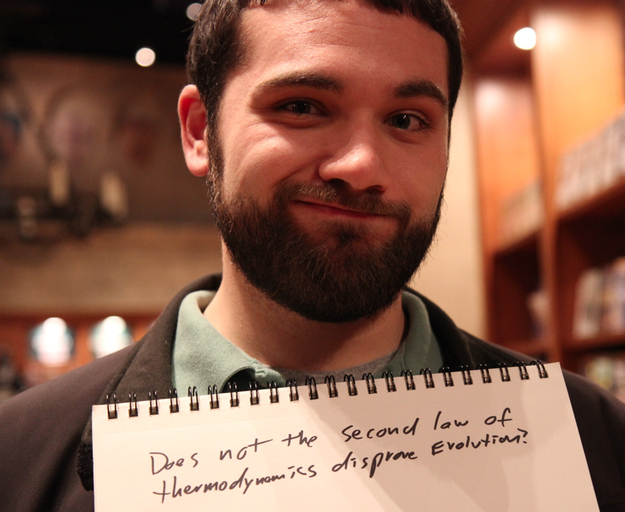 To answer the man’s question, the second law of thermodynamics does not disprove evolution. The second law states that the entropy of an isolated system never decreases. That is, things because less orderly and more chaotic over time without an input of energy from an outside source. Since the Universe is an isolated system as near as we can tell, all the organization we see will eventually dissipate – no more stars or planets or black holes or anything else that uses energy. Eventually even all atoms will cease to move. Of course, we don’t need to even go as far as the Sun – at least so long as we aren’t talking about plants or photosynthesizing bacteria. We take in energy all the time. It ultimately comes from the Sun and, to an extent, Earth’s core and magnetic field, but on a day-to-day level, we don’t exist in a closed system at all. A dinosaur that killed another dinosaur had a source of energy to take in: the dead dino. An early hunter-gatherer would find energy by hunting and gathering. And right now I’m about to go find some energy in a hot chai tea. As with the so-called vestigial structures—another evolutionary construct—function is, ultimately, irrelevant. A structure is “vestigial,” or DNA is “junk,” not by virtue of any objective criterion dealing with function, but because evolutionists say so. [Vestigial] refers to an organ or part (for example, the human appendix) which is greatly reduced from the original ancestral form and is no longer functional or is of reduced or altered function. Vestigial structures provide a clue to the evolutionary history of a species because they are remnants of structures found in the ancestral species. It’s easy to see Hunter’s error. A vestigial structure need not be related to function whatsoever – and that doesn’t therefore mean that it is merely the say-so of biologists that makes it vestigial. The human ear, for instance, has vestigial muscles that don’t do anything; in our ancestors (and cousins), their function is to swivel the ear for better directional hearing. That’s vestigial, it’s evolutionary, and it’s science. DNA comparison can, does, and will show that when looked at. Furthermore, a vestigial structure can have a function while still being vestigial. For instance, whales have remnants of hind legs that clearly are not used for walking. However, they do play a role in where muscles are attached. Again, that’s vestigial, it’s evolutionary, and it’s science. Hunter just isn’t familiar with these things. It’s one thing to have a poor grasp on the English language, but then to have the overt insult go over his head is just monumental. via Fundies Say The Darndest Things. I was hunting around for some blogging ideas recently when I came across this post by Wintery Knight. It’s basically a copy and paste job because Mr. Knight is not qualified to speak of anything in biology (and he has amply demonstrated as much). However, the person he extensively quotes, Cornelius Hunter, is also 100% unqualified to analyze the world of biology. I’ve written about Hunter in the past. The theory of evolution states that the species arose spontaneously, one from another via a pattern of common descent. This means the species should form an evolutionary tree, where species that share a recent common ancestor, such as two frog species, are highly similar, and species that share a distant common ancestor, such as humans and squids, are very different. But the species do not form such an evolutionary tree pattern. In fact this expectation has been violated so many times it is difficult to keep track. These violations are not rare or occasional anomalies, they are the rule. Hunter is only leading into his mention of convergence here, but he’s already off to an embarrassing start. He’s attempting to claim that we don’t see an expected pattern of descent because that pattern is premised on the idea that similar traits must come from closely related organisms. He is factually incorrect. All he has described here is one method for determining relatedness between species: morphology. And even then, he has grossly over-simplified the process. For instance, take the skull of a dingo versus the skull of a Tasmanian tiger. They resemble each other quite closely, but they aren’t exactly the same. The latter has two holes in the roof of its mouth, a characteristic of marsupials. Go further and one will see that they also have different genetic codings. Many examples are the repeated designs found in what, according to evolution, must be very distant species. Such evolutionary convergence is biology’s version of lightning striking twice. To explain this evolutionists must say that random mutations just happened to hit upon the same detailed, intricate design at different times, in different parts of the world, in different ecological niches, and so forth. Were Hunter to take a peak at the genes in a Euphorbia, he might notice that they are markedly different from the genes in a cactus. That’s because, while both plants are prickly desert survivors, one is from the Malpighiales order whereas the other is from the Caryophyllales order. They have significantly different genotypes, but similar phenotypes. In other words, Hunter’s argument that random mutations are always hitting “upon the same detailed, intricate designs at different times, in different parts of the world, in different ecological niches” is not only verbose, but entirely wrong. It would be as though he said home builders have hit upon the same intricate design because some use cellulose insulation while others use spray foam. It’s the same result by a different means. Everyone has heard of the kangaroo and its pouch. It is a marsupial—mammals that give birth at a relatively early stage in development, and then carry their young in a pouch. There are a great variety of marsupials that are curiously similar to a cousin placental species. The flying squirrel (a placental) and the flying phalanger (a marsupial) are one such example. Because of their reproductive differences evolutionists must say they are distantly related on the evolutionary tree. Yet they have strikingly similar designs which must have been created independently by random mutations. Every mutation leading to the two different species must, according to evolution, have been random (that is, independent of any need). No, natural selection doesn’t help. First, his mutation argument is still wrong. Second, it isn’t merely reproductive differences that tell us the flying squirrels (which are two independent groups of rodents) are different from the flying phalanger. There is also evidence from their genetic relatedness, not to mention the obvious fact that one is placental and the other a marsupial. Third, of course natural selection is relevant here. That’s the whole reason two species are able to converge on the same solution to similar problems; natural selection has found an efficient solution to one problem faced by two species. Though evolutionists sometimes deny biological convergence, it is a scientific fact. I don’t know what Hunter is talking about, but that’s okay because I don’t think he does either. Thus, two phylogenetically remote organisms, katydids and mammals, have evolved a series of convergent solutions to common biophysical problems, despite their reliance on very different morphological substrates. Now, remember the crux of Hunter’s opening: Similar morphology is the same thing as intricate design, thus Jesus. Yet here we see a “reliance on very different morphological substrates”. That is, natural selection in some insects has hit upon the same broad method for attaining hearing as it has in mammals, but it goes about the process in a largely different way, relying upon the insect phenotype it has already given itself. So not only is Hunter’s argument wrong from the get-go, but even if we’re generous and grant him his incorrect basis, he still gets blown out of the water. He has managed to somehow be wrong in his wrongness. It’s one thing when someone branches into biology from time to time, relying upon the insight of others. We see that with Wintery Knight (the reason being that he hasn’t a clue about the field). We can’t expect everyone to be an expert, even if they should know better. However, Cornelius Hunter is another story. This is a guy who fancies himself qualified and reasoned, able to break down complex scientific ideas. Yet what we see is a man unable to even come remotely close to getting much of anything right about a relatively simple idea. And he keeps trying, getting things wrong every. single. time. But I thought people with degrees couldn’t be anti-science?! Got that? Someone who has an engineering degree can’t be anti-science. It just can’t happen. I mean, come on! It’s a science degree! Of course, we have to ignore the fact that she has argued that condom use is ineffective because not everyone uses them in South Africa. And we have to ignore the fact that she has claimed that HIV rates have fallen because of abstinence only education (when, in fact, condom education drives are the primary reason for the decline, not to mention the fact that abstinence only education has been shown to be largely ineffective). And ignore the fact that she has argued that the scientific concept of conception is the same as the philosophical (and subjective) concept of humanity. Ignore it all. She has a degree. It’s sort of like how President Obama has a law degree. I’m sure it will only be a matter of time until far-right, Obama-hating conservative Roxeanne starts arguing that the President can’t hold views that, in her opinion, are against the constitution since he has a J.D. Broun also said that he believes the Earth is about 9,000 years old and that it was made in six days. The Republican lawmaker made those comments during a speech Sept. 27 at a sportsman’s banquet at Liberty Baptist Church in Hartwell. Broun, a medical doctor, is running for re-election in November unopposed by Democrats. He also has a B.S. in chemistry. I think everything here is pretty clear. Anyone who has a degree in some science cannot possibly be anti-science. Hell, someone who claims otherwise ought to be prepared to get “smacked down” pretty quickly. At least that’s the world according to Roxeanne de Luca. I really should just point to The Blind Watchmaker and call it a day, but I’m a sucker for punching bags, so let’s get started. First Datechguy says mutations are necessary for speciation. This isn’t all that far off from the truth, but it isn’t exactly accurate. Mutations are going to happen – each one of us has about 150 in our DNA right now – but they are not entirely necessary. All that needs to happen for a speciation event is for enough time, space, and natural selection to take place. That is, natural selection is a honing process, so it is theoretically possible for it to promote some alleles while eliminating others in a way which prevents breeding between two populations that once were able to produce offspring. The second point is myopic in nature. Datechguy appears to be implying that mutations are for the sake of prey. I never realized that predators and organisms without predators were not involved in evolution. But I digress. We see beneficial mutations all the time. For example, humans which began to utilize animal milk once we started to create civilizations had their lactase producing gene left on after childhood, thus enabling the break down of lactose. That legacy continues in many Europeans and those of European descent. Datechguy has not made a significant point here. The fourth point is another weird one. A mutation needs not be dominant to be carried throughout a population. If it did, Mendel never would have had green or wrinkly peas. The final point – that “continual breeding has to take place so that dominant trait spreads until all members of the species without that dominant trait disappear” – is my favorite. Datechguy is arguing that fixation is necessary for speciation to occur. As we saw with the 2010 Burke paper, evolution still very much occurs with or without complete fixation. In fact, allelic fixation varies between sexually and asexually reproducing populations, so it is improper to speak of it in blanket terms. Or to put it another way, if you saw me roll snake eyes 10 times in a row, what would be the first logical thought? Luck or fixed dice? How about 100 times? How about 1000? It’s a common mistake to believe that any given trait or characteristic needs to evolve in either one giant leap or through a series of perfectly coordinated mutations. Fortunately, that isn’t how evolution works. Natural selection operates via incredibly tiny steps, one by one. When looked at over the course of hundreds of thousands of years or more, we have a huge number of mutations and allelic changes that appear impressive, but the reality is that virtually all of those changes were individually likely. And, just as importantly, each one of those changes is individually useful. (I’m ignoring historical contingency for the sake of brevity.) For instance, an eyespot won’t enable any creature to see danger or prey from miles away, but it is useful for detecting light and dark and, eventually, color, shape, and size. I imagine Roxeanne and Datechguy will be very happy together at a site that, as with her last one, entirely lacks all scientific value.